Sign up for Broadjam today to follow MONEYSHOT, and be notified when they upload new stuff or update their news! "THE NEW FACES OF ROCK"
Delivering a blistering set of energized music that is guaranteed to leave a twisted smile on your face. MONEYSHOT has based their image and ideas around a good time attitude and a sincerity that all can relate to. They have created something dynamic and new that leaves you wanting more. MONEYSHOT is James Ryan Vanover (Vocals), Dana Walsh (Lead Guitar), Jim Coker (Drums), Manny Lawrence (Bass), and Bret McCosh (Guitar). MONEYSHOT is working very hard on building a regional fan base,releasing their second CD and generating radio airplay.They're currently seeking booking agents and business managers. 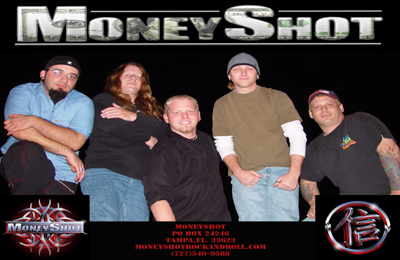 Also check out www.moneyshotrockandroll.com for everything MONEYSHOT!! !